Passion is Pascal Dusapin’s sixth opera. Having received its premiere on 29 June, this was its fourth performance. Interviewed in Le Figaro, Dusapin speaks of the inspiration he has derived from Monteverdi and his age: ‘‘I have a very profound relationship with this period in musical history, which greatly resembles our own in its taste and its experimental research.’ The idea of music as research has a clear kinship with IRCAM and, before that, Darmstadt. Dusapin, following a brief spell of study with Messiaen, became Iannis Xenakis’s sole acknowledged pupil in composition. Yet Dusapin’s comparison, rooted as it may be in his own experience, is not without historical merit. The Florentine Camerata was a group of intellectuals whose theoretical discussions and experiments, attempting to restore a posited unity in Attic drama of speech and song, fully bore fruit in the operas and indeed many of the madrigals of Monteverdi. 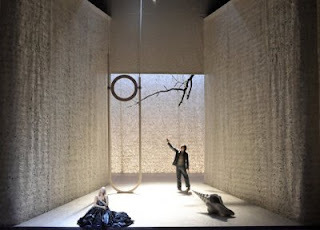 Use of Italian, in a libretto put together by Dusapin himself and Rita di Letteriis, inevitably brought one a little closer, as did the subject matter: another revisiting of the Orpheus myth, although here the ‘characters’ are not even named. 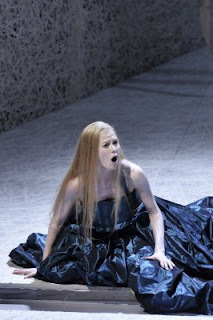 An especially noteworthy aspect of Dusapin’s work is the greater interest shown in Eurydice. That said, ‘influence’ upon Dusapin would seem, to be more a matter of working in a similar spirit – as the Camerata had renewed the spirit of Greece – than of any real stylistic revival, although there were a few instances if not of quotation than of affinity. An exception might appear to be the use of the harpsichord (Ueli Wiget), synthesiser (Hermann Kretzschmar), and harp (Saara Linnea Rautio), but their – extremely effective – employment was not really of a continuo variety; instead, the instruments were used both in solo and chamber contexts. It seemed to me that the instruments tended to be used separately from one another earlier on, with some sort of fulfilment or at least climax being denoted by their subsequent combination, a practice putting me in mind of – this may denote nothing other than coincidence – Stravinsky’s Symphony in Three Movements. A memorable instance of solo employment is in the lengthy harpsichord music – sometimes punctuated by other instruments, but essentially a solo – that accompanies Orpheus’s mime as he dons the unicorn’s head. This seemed to me to hark back less to the Italian than to the French Baroque and there was indeed some music that approached the frankly tonal. The contributions from all members of the Ensemble Modern were excellent, with Franck Ollu keeping a tight but expressive grip upon proceedings. Extended instrumental techniques were sometimes used, though nowhere near so often as one might expect in, say, the work of Helmut Lachenmann, and there was no amplification. Insofar as I could tell from a first hearing, the role of Thierry Coduys in terms of electronic spatial direction appeared beyond reproach. In all of these respects, I cannot imagine that the score could readily have been served better. Barbara Hanningan, whom I have recently heard give outstanding performances of music by Nono, Berg, and Webern, shone once again here. Occasionally I felt that she lacked the warmth of tone I had heard her project on previous occasions, but in a new work it is often difficult to know how much this might have been attributable to the demands of the music and interpretation. Certainly her range and precision were as impressive as ever, as was her acting. Georg Nigl was subjected to equally great demands in his part. He appeared to grow into the part, his tone sounding a little pinched earlier on but extraordinarily impressive subsequently in terms of ranging from the baritonal to the haut-contre. Once again, his acting skills were noteworthy. The varied contributions of the Marseilles-based Ensemble Musikatreize were throughout of the very highest order. Its members’ musical and dramatic versatility, both individually and corporately, would have been apparent to all. Their interventions on stage and throughout the theatre always looked and sounded well-judged. The production also seemed to me a triumph. Giuseppe Frigeni eschewed an overly naturalistic presentation, in terms of a stylisation that worked. Every movement – unlike so many current productions one could name – appeared to have a justification, and therefore told most effectively. The production drew inspiration from, rather than pointlessly railing against, the text and music, although this should in no sense be taken to betoken an unimaginative literalism. Symbolism rather was the order of the day. Lighting and costumes contributed to an impeccable team effort. In the programme, Frigeni also drew our attention – although he hardly needed to – to the centrality of the sun, or ‘le sol(o)eil’, as he put it, punning on the French words for sun and eye. The senses of watching, of being watched, and also, crucially, of transformation of time, were simply but powerfully portrayed by the figure of the sun on stage and its movements. This helped deliver us to our destination, the unsettling conclusion, in which score, performance, and production worked so closely together, to ask us whether Orpheus and Eurydice had ever really been listening to each other – or, indeed, whether they had truly been looking at each other. Passion left us asking more questions than had been answered: not a bad sign at all. Ayant vu cet opéra (quoi qu'avec une autre distribution), je ne peux qu'abonder dans le sens de cette critique.